Have you ever passed by a vegetable in the grocery store and wondered, “What IS that?” If so, you may have been looking at kohlrabi. With a bulbous shape and texture similar to that of broccoli stems, this member of the cabbage family is more alien (It is even referred to as “space cabbage” at times!) than it is earthling. That may soon change though as chefs and home cooks alike are embracing kohlrabi for its out-of-this-world health benefits and versatile preparations. Because kohlrabi is easy to grow and fast to mature, it is a popular crop from late spring to early fall. However, it thrives when temperatures are on the cooler side. Kohlrabi can be white, light green, or bright purple. The entire plant is edible all the way up to the leaves, but the bulb is most commonly used. Generally speaking, the smaller the bulb, the more tender it will be when eaten. Stored in the refrigerator, a fresh bulb can last for up to one month. As far as taste is concerned, this vegetable is similar to its cabbage counterparts in that it has a sweet flavor with a bit of bite, almost like a radish. While kohlrabi is only now making a name for itself in the United States, it has long been a major player on the international food scene. Cultivated in Europe since the 1500s, this vegetable is particularly beloved in Germany. Translated, its name can be broken down into ‘kohl’ (German for cabbage), ‘rabi’ (turnip), providing an accurate description of what it tastes like, too. With the Germans being both the largest producers and consumers of kohlrabi, they serve it alongside everything from eggs to roasts to salads. Kohlrabi also makes frequent appearances in Indian cuisine. Referred to as ‘knolkhol’, kohlrabi pairs well with the warm spices native to India. There, you might find it plated with dal and brown rice, or pickled to be consumed with bread and yogurt. One of the main reasons that kohlrabi has found its way to our shores is that it is extremely healthy. It has zero fat, with a cup of raw kohlrabi containing approximately 36 calories. Like other members of the brassica oleracea family, it is high in fiber and has a high ratio of vitamin content including B-12, A and C. Loaded with iron, and boasting purported anti-cancer and anti-inflammatory properties, kohlrabi is virtually one of the healthiest vegetables on the planet. With Millennials putting greater stock into their diets, it should come as no surprise then that kohlrabi is being touted amongst them. 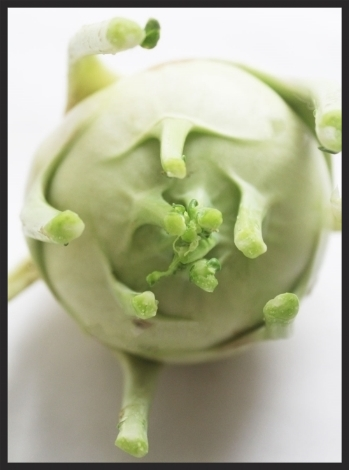 Perhaps the greatest characteristic of kohlrabi though, is that it is incredibly versatile to work with. It can be eaten raw, bitten into whole like an apple, or sliced and made into a salad. It also works well when cut into matchsticks and tossed with cabbage for a non-traditional take on coleslaw. Kohlrabi is just as good steamed as it is grilled, or roasted with a drizzle of olive oil, salt & pepper. If you are still unsure of what to do with kohlrabi, try using it as a substitute in a dish you would normally make with Brussels sprouts or kale. You just might find that it’s your new favorite crunchy-healthy-trendy-user-friendly-veggie altogether!